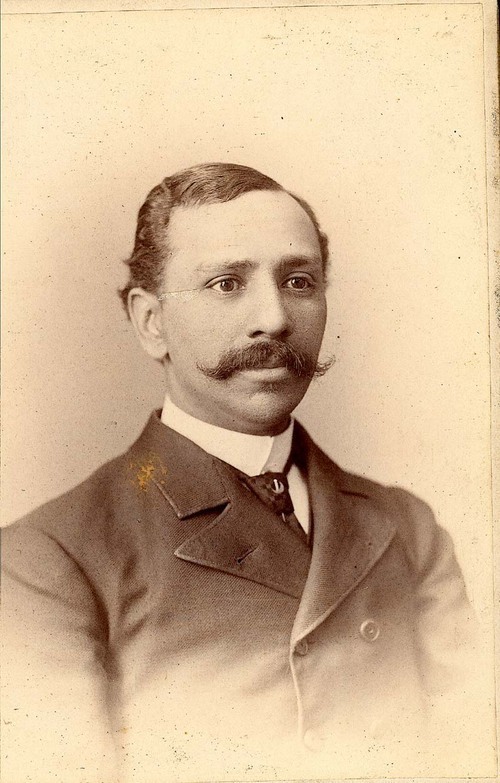 Edward McCabe was born in Troy, New York to a small, racially mixed family that moved around from New York to Massachusetts, to Rhode Island, and then to Chicago where he received his education, becoming a lawyer, before arriving in Kansas in 1878. He settled with the Exodusters in the black community of Nicodemus in Graham County where he became a clerk and practiced law. In 1882, McCabe was elected state auditor and held the office until 1886. He continued working with Republicans and attempted to run for state treasurer in 1889 but lost. McCabe then went to Washington, D.C. to lobby newly-elected President Benjamin Harrison to champion African American voting and civil rights. McCabe then moved to Guthrie, Oklahoma where he was persuaded by Preston Plumb, a member of the U.S. Senate from Kansas, to start a black community. McCabe headed south where he founded Langston. For a short time, it seemed that there would be a large contingent of black settlers in Oklahoma and McCabe would be their leader but the idea caused hatred and fear among the white settlers and many American Indians. McCabe was not a very effective leader as he never fully helped promote the black cause or alleviate white fears. Instead, McCabe focused on his own political ambitions. He founded the Oklahoma Colored Agricultural and Normal School and was appointed Logan County's first treasurer and it seemed as if McCabe was gearing up to make Oklahoma an "all-black" state and was hoping to be appointed territorial governor. Unfortunately, the political parties divided along racial lines causing Republicans to rethink strategies. McCabe served as assistant auditor for the Oklahoma Territory under several governors but lost that job when Democrats took over when Oklahoma became a state. McCabe fought against Plessy v. Ferguson and even argued in front of the Supreme Court that separate but equal was unconstitutional but the Court held that it did not violate the Constitutional. McCabe left Oklahoma sometime in 1908 for Chicago where he died in 1920, forgotten. His body was returned to Topeka where he was buried in Topeka Cemetery. In 2002, eighth graders from Eisenhower Middle School raised money to replace McCabe's crumbling gravestone. SEC. OF NICODEMUS TOWN CO.